“On graduation day when they handed me my diploma, they were handing me my freedom!”- Roy Juarez Jr.
Sophomore year started out like any other school year, and we quickly fell right back into the same routine; we reunited with friends, compared class schedules, and simply enjoyed the fact that we were no longer freshmen. 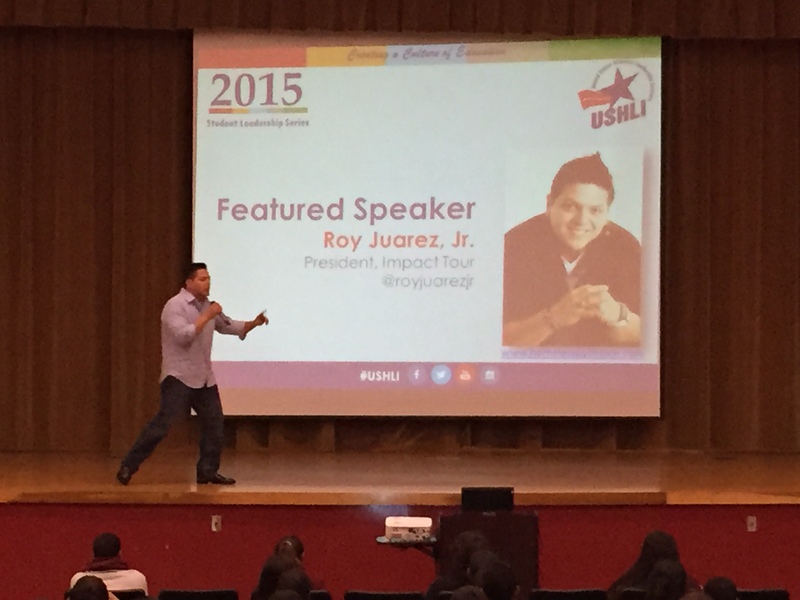 Recently, the tenth grade class was asked to attend an assembly in the auditorium with inspirational speaker Roy Juarez, Jr. At first, we didn’t know what to think. Yet his story would soon make everyone gasp for air and bring a few tears to our eyes; it touched so many hearts in the audience, people were talking about it for days. Roy Juarez, Jr. grew up in east L.A, with anything but a normal childhood. He was raised in an abusive household, exposed to the constant ridicule of his alcoholic father, and was forced to witness these events through the eyes of his siblings and his mother. He was thrown into situations he had no clue how to deal with. Roy was constantly hearing his mother’s screams while she was experiencing the wrath of his father. “Mijo help me!” was the usual request; and although Roy could hear her, he was paralyzed with fear. Finally, he escaped from his abusive father and he moved from home to home. They were always on the run never knowing whether he was waiting around the corner. Then Roy’s mother met a cop and soon the family became at ease, until the father found them again. Roy wasn’t worried about it “ he’s a cop; my dad isn’t going to do anything.” Unbeknownst to Roy, the police officer was planning on throwing him and his siblings out of the house. The biggest betrayal came from his mother, who chose to stay with the cop and leave her own children behind. Roy and his siblings became homeless again, eating ketchup packages and starving to death. As the 10th class continued to listen to this gripping tale, they became more and more interested as Roy explained the details of his story. One day, he snuck into a hotel while a speaker was giving a speech, a woman from the military. That night Roy learned a few things he would never forget. He learned a new mindset; “to never give up on your dreams“. Roy was a high school dropout, but he still needed help. He went to a church seeking shelter, and was assured assistance only if he complied with one rule; Roy needed to go back to school and graduate. He was skeptical at first, because everyone that usually offered help wanted something in return. Yet he replied, “yes, it’s been my dream”. Roy never thought he could be anything, but he graduated high school and went on to the community college. Living homeless again for an extra two years. Roy eventually was reconciled with his mother and his siblings. Roy now travels across the United States and provides students of different schools an opportunity to hear his inspiring story. As he says, “Always chase your dreams and give education a chance”. At the end of this jaw dropping story, the crowd rose and clapped for a long time. A young lady from the audience stood up and said, “when you were talking about living in the streets, it reminded me of my dad. You went from, wondering where you are going to sleep tonight, to crossing the United States bringing your inspirational words to students. My father went from living in the projects to having his own company”. That young woman is this reporter. Here in our school, we are lucky to give assistance through the Christ Fellowship Program for students that might find themselves in a similar situation to Roy. Please know that help is always offered by our counselor, Mrs. Mills. That is awesome. I just saw this! Thank you! Hey Roy, this is Ashley who wrote the article. Thank “YOU” for the motivation.